There are two types of beam transmission within the laser die cutting machine circle: Gantry and Galvo. The gantry system of laser die cutting machine uses a laser source in which the laser head moves or stays stationary on the XY plotter system and the material moves to a position below the head. This type of laser die cutting has proven successful for high precision parts such as membrane switches, where critical tolerance cutting of inserts or switches is critical. The gantry laser die cutting machine system also has inherent advantages when cutting materials with a thickness of more than 800 microns or in wide prints. The biggest complaint about the gantry laser die cutter system seems to be the speed of operation. Since the material or head needs to physically move to a position around the cutting pattern, the gantry laser die cutting machine system may be very slow. There are applications in the manufacture of automotive parts, where the laser head is mounted on the end of the robot and the precision and relative speed work together. The Galvo laser die cutter system has made the most significant progress in the area of laser die cutting in the past few years, especially in the label, medical equipment and nameplate industries. 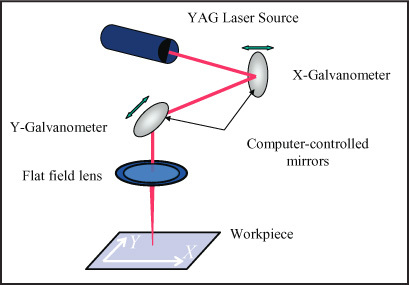 The Galvo laser head remains stationary above the mesh or sheet material, and the mirror inside the head is fine-tuned to redirect the laser path onto the substrate. Because the laser source changes direction through the mirror, the Galvo laser die cutting machine head is cutting the angle, so the thinner the material, the better. This is in contrast to a gantry laser die cutter, which always moves directly above the cutting area and points directly downwards. The Galvo laser die cutting machine system is currently being marketed as a sheet, roll, or combination sheet and roll feed system. They are used in a variety of materials, including polyesters, plastic films, paper, adhesives, and abrasives. One of the few materials that cannot be regularly cut on a laser die cutter system is PVC, because gas and substrate discoloration occur when the material is burned when the material is cut. The Galvo laser die cutter system also adds rotary die cutting stations and laser markings to its product portfolio while running on-line with digital presses. The ability to complete a new job in the morning and transport finished parts in the afternoon makes the laser die cutting system a lucrative opportunity for many printers.